First, we understand what it is that you want in a bike. What materials are you looking for, what kind of ride qualities do you want, what distances might you be riding and are there specific events for which this bike is intended? What specific characteristics do you need? Everyone is very different and has a different set of criteria for bike. We listen to you. This is where the fun begins! You tell us what you want to do where it comes to test riding bikes. We have 100 bikes available for test and we can help you choose the right one(s) to take out. A test ride is optional, but we encourage it. By test riding, you get to feel the different rides of the various bikes. This helps you communicate with us, also, about what aspects you like. We can use data gathered from your test rides to perfectly match your ideal ride with specs that Seven will build into the bike. Ask us for a demo ride. Take the bike(s) to the roads where you want to ride and ride as long as you want! We discuss everything surrounding who you are, what bike(s) you currently ride and the ride characteristics and qualities of your future bike. Seven Cycles provides a detailed order form called the Custom Kit which helps guide the conversation ensuring every bit of relevant information about you and your riding is gathered. This is a guarantee that we perfectly communicate everything to Seven such that they can design the bike exactly to your specifications. We design more Seven bicycles than any other retailer, it's our specialty. We have developed forms that augment the information Seven requests so we can bring more to the design process than just data collection. Also, our unique relationship with Seven enables us to do a better design job. Also included in this meeting of typically 1.5 to 2 hours, we take body measurements that are critical to establishing the geometry of the bike. We learn about any injuries you may have and cycling-related issues. Seven hard at work designing your new bike for you! 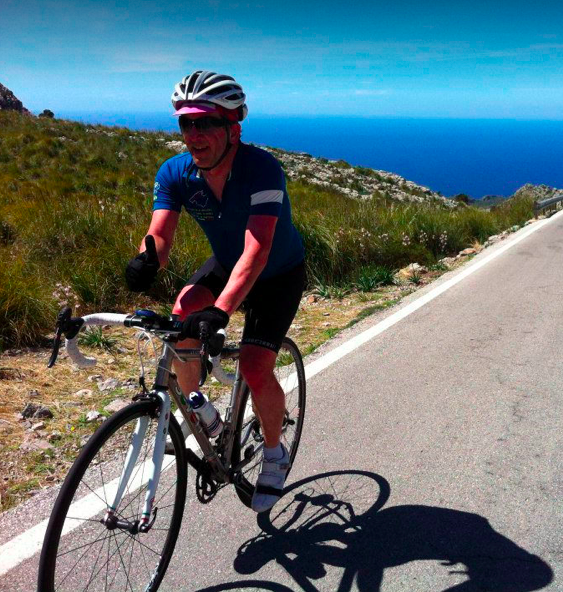 We send the completed Custom Kit to Seven via email so that they can design your bike. They turn the design around within 5 days and send us back their recommendations and frame geometry as well as explanation of other nuances of the design. Note that when Seven designs the bike, it's not just geometry (fit and comfort) that is determined. They choose each tube to be the correct thickness and composition to achieve the ride quality you desire. They consider the handling and performance of the bike, the features and options you want as well as how this bike will need to fit and function for you in the future. In the fitting, you'll work with a professional fitter who has a lifetime of fitting expertise as well as knowledge of thousands of fittings that have been successfully done with others. Upon receiving Seven's proposed bike design, we schedule you to return for the final fitting. 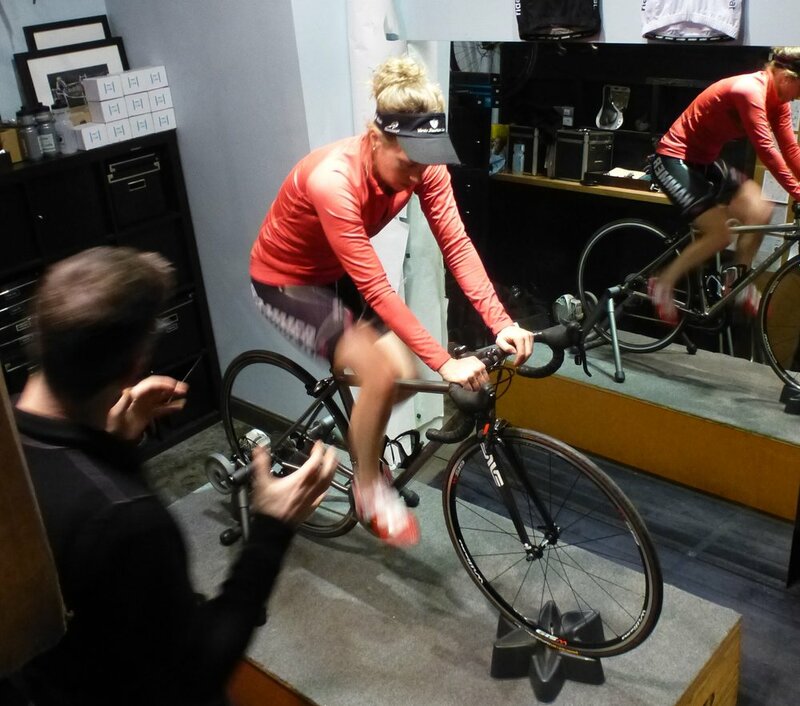 During this session, we have our expert bike fitter set you up on a bike to the position Seven recommends. This is the opportunity to see how this position feels and make changes to the geometry or any other aspects of the bike design or kit you prefer. Once the final design and components are decided upon (typically during this conversation), a 50% deposit of the final price of the bike is required in order for Seven to begin production of the bike. Meeting her frame for the first time at the Seven Cycles factory. We communicate the final design to Seven and they get right to work on your bike! An unpainted titanium frame typically takes 3-5 weeks to manufacture and build and a painted frame will need approximately 4-6 weeks longer, depending on the time of year. If you'd like to see the bike manufacturing process, let us know! We frequently take group Seven factory tours and we want you to get the full experience of how a frame comes to life. In the meantime, we order the components for the bike so they are ready for the frame when it arrives here from Seven. A bike in the build process. We receive the frame from Seven and give you a call or email to schedule your bike pick up. 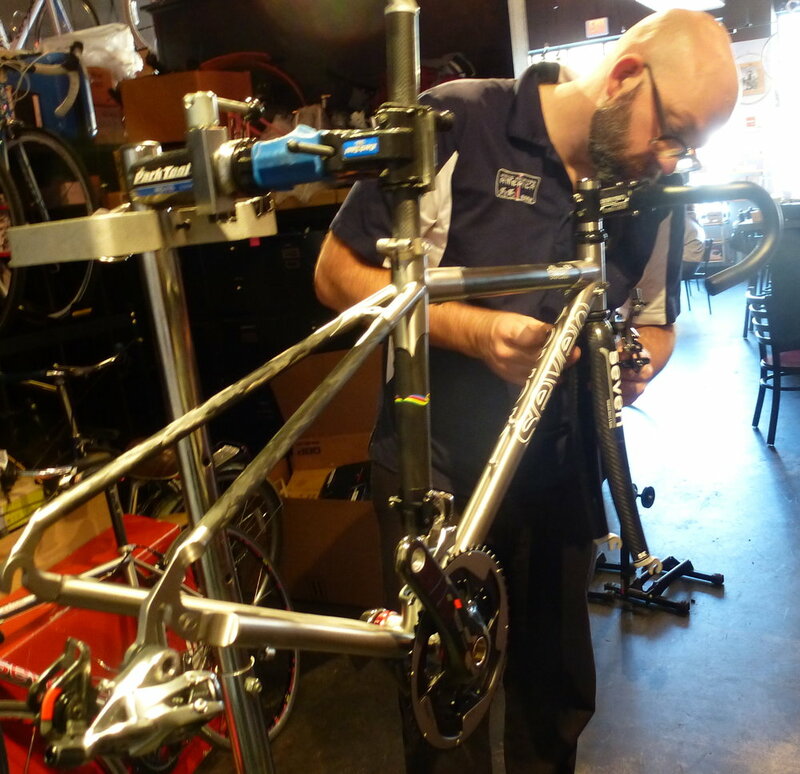 Our professional mechanic will assemble your bike and have it measured up so that it's in the right position for you, per your final fitting. Any other accessories (such as bottle cages, saddle bags, bike computers, etc.) are installed so the bike is ready to ride the moment you pick it up. Meeting his new Seven bike for the first time. The day has come for you to pick up your bike-the only one just like it in the world! Typically, the bike will fit you without making any adjustments. You can choose to get on your bike with our fitting specialist or just take it out for a ride, whatever suits you best. We are always happy to make adjustments after you've had some time to ride your bike and get used to the newness of it. Remember that after riding your bike for ~100-200 miles, the cables will stretch (if you have a bike that uses cables). All labor for the first year of your bike is included with every Seven bicycle purchase. We have a schedule of recommended service for your new bike, to keep your bike looking and riding as good as new. We send you home with this on the day you pick up your bike. From the initial test ride until you are riding your very own custom-designed, hand-built Seven bike, a minimum of 4 weeks will have elapsed. More time is required if the bike is painted or if specialty components are needed. If you have a race or event coming up that you need the bike for, let us know. We are Seven's #1 dealer in the world and have production priority. We want you to be riding as soon as possible! This time is short in comparison with the many years you will enjoy the best bike rides on your very own Seven. Curious about having your own custom-designed and hand-built Seven Cycles bike? Contact us! It's new bike day and there are many smiles!